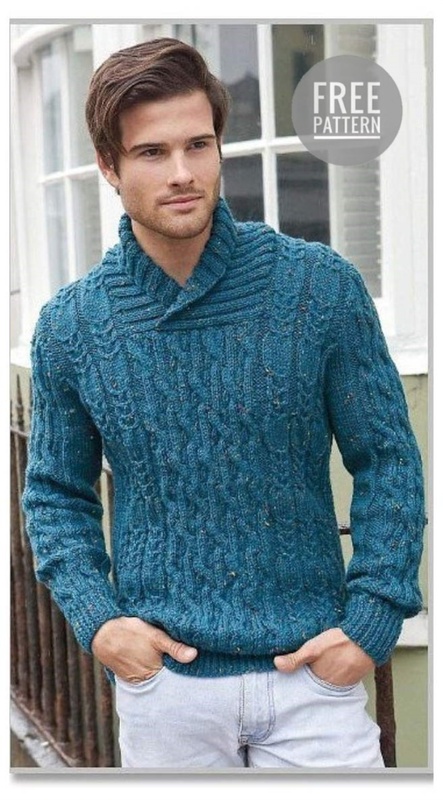 You will need: King Cole Fashion Aran yarn (70% acrylic premium, 30% wool, 200 m / 100 g) - 700 [700: 700: 800: 800: 800] blue, needles No. 4; No. 4.5 and No. 5, markers. Resin 1/1: inversely 1 person., 1 w., Start of 1 person. a row with 2 persons. p.
Gum 2/2: inversely 2 persons., 2 ex., start the 1st person. a row from 3 persons. n.
Facial smoothness: persons. R. - persons. n., izn. R. - izn. n.
Cross-section 6 point (C6): remove 3 point on add. Spokes before work, 3 persons. p., 3 persons. n. with add. knitting needles. Reassign 8 point (C8): remove 3 point to add. a girl at work, 1 person. p., 3 persons. Clause c Supp. crib, remove the trail. loop before work, 3 persons. p., 1 person. n. with dop. knitting needles. Braid Pattern: Row 1 (Persons): 7 [1: 5: 10: 3: 8] n., 3 out. p., (8 persons. p., 3 out. p.) 2 [3: 3: 3: 4: 4] times, (6 p. 2, 2 res. p., 2 persons. p. 2 Izn.) 3 times, 6 persons. Sec., (3 out., 8, p. 2) 2 [3: 3: 3: 4: 4] time, 3 out. Clause 7 [1: 5: 10: 3: 8] n.
Lane 2: 7 [1: 5: 10: 3: 8] PHI. p., 3 persons. p., (8 out., p. 3 persons. p.) 2 [3: 3: 3: 4: 4] paza, (6 out. p., 2 persons. p., 2 res. p., 2 p. 3), 6 b. p., (3 persons. p., 8 out. p.) 2 [3: 3: 3: 4: 4] time, 3 persons. Sec. 7 [1: 5: 10: 3: 8] int. Rows 3 - 6: Repeat 1-2 rows 2 times. Range 7: 7 [1: 5: 10: 3: 8] n., 3 out. p., (8 persons. p., 3 out. p.) 2 [3: 3: 3: 4: 4] times, (C6, 2 out. p., 2 persons. p., 2 out. p. ) 3 times, C6, (3 out., 8 persons.) 2 [3: 3: 3: 4: 4] time, 3 out. p. until the end. Row 8: as 2nd row. Ranks 9 - 10: as 1-2 ranges. Rows 11: 7 [1: 5: 10: 3: 8] n., 3 out. P., (C8, 3 out. P.) 2 [3: 3: 3: 4: 4] time, (6 persons, 2, 2 paragraphs, 2 persons, 2 out. ) 3 times, 6 persons. Sec., (3 int. C8) 2 [3: 3: 3: 4: 4] times, 3 res. p. to the end. Row 12: as row 2. Row 13: 7 [1: 5: 10: 3: 8] p., (3 int. p., 8 persons. p.) 2 [3: 3: 3: 4: 4] times, 5 res. p., (2 persons. p., 2 ex., p. 6 persons. p., 2 res. p.) 3 times, 2 persons. n., 5 out. p., (8 persons, p., 3 out. p.) 2 [3: 3: 3: 4: 4] paza, persons. until the end. Range 14: 7 [1: 5: 10: 3: 8] int. Sec., (3 persons. Sec., 8 out. Sec.) 2 [3: 3: 3: 4: 4], 5 persons. p., (2 out., p. 2 persons. p., 6 out. p., 2 persons. p.) 3 times, 2 res. p., 5 persons. p., (8 out. p., 3 persons. p.) 2 [3: 3: 3: 4: 4] times, out. until the end of the row. Row 15: 7 [1: 5: 10: 3: 8] Sec., (3 int. C8) 2 [3: 3: 3: 4: 4] times, 5 int. p., (2 persons. p., 2 out., p. 6 persons. p., 2 res. p.) 3 times, 2 persons. n., 5 out. paragraph (C8, 3 ex. paragraph) 2 [3: 3: 3: 4: 4) times, persons. to the end. Range 16: like row 14. Rows 17 - 18: like 13-14 rows. Row 19: 7 [1: 5: 10: 3: 8] Sec., (3 int. C8) 2 [3: 3: 3: 4: 4] times, 5 int. p., (2 persons. p., 2 out. p., C6, 2 out. p.) 3 times, 2 persons. n., 5 out. paragraph (C8, 3 ex. paragraph) 2 [3: 3: 3: 4: 4] times, 7 [1: 5: 10: 3: 8]. p. Row 20: like row 14. Rows 21 - 22: like 13-14 rows. Row 23: how about 15. Row 24: as row 14. Repeat 1-24 rows. Pattern with braids for the hand: Row 1 (persons): 2 [3: 3: 4: 4: 5] persons. n., 3 out. p., (6 persons. p., 2 ex., p. 2 persons. p., 2 res. p.) 3 times, 6 persons. n., 3 out. P. 2 [3: 3: 4: 4: 5] P. 2: 2 [3: 3: 4: 4: 5] and con. p., 3 persons. p., (6 out. p., 2 persons. p., 2 res. p., 2 persons. p.) 3 times, 6 res. p., 3 persons. Sec. 2 [3: 3: 4: 4: 5] inside out. n.
Rows 3 - 6: repeat 1-2 lines 2 times. Row 7: 2 [3: 3: 4: 4: 5] n., 3 out. (C6, 2 out., 2 persons., 2 out.) 3 times, C6, 3 out. P. 2 [3: 3: 4: 4: 5] Sec. 8: as the 2nd order Retry 1-8 rows. Knitting strength: 18 s. X 25 rows = 10 x 10 cm. stitch, knitting number 5. The back: on the needles number 4, fill 83 [93: 101: 111: 119: 129] n. Tie 9 cm rubber 1/1, finish off the faces. beside. The following is (int. ): 8 [2: 6: 11: 4: 9] int. p., * knit out of broach izn. pet, 3 out. p. [4: 4: 4: 5: 5], repeat from * to the last 9 [3: 7: 12: 5: 10] p., knit from wear and tear. loop, izn. to the bottom of the row = 106 [116: 124: 134: 142: 152] p. Change the spokes to No. 5 and knit with a pattern with scoops to a total height of 47 cm from the beginning, end the painting. in a row. Forming armhole. Close the free 5 [6: 7: 7: 8: 9], n. At the beginning of the trail. 2 row. Reduce 1 point at the end of the trail. 5 [5: 5: 7: 7: 9] rows, then in each second row = 82 [88: 94: 98: 104: 110] p. ** Then knit just to a total height of 65 [66:67:69: 70:71] cm, finish izn. beside. Formulation of the shoulders. Close at free 7 [8: 9: 9: 10: 11] n. At the beginning of the trace. 4 rows, then 8 [8: 8: 10: 10: 11] on point in the beginning of the session. 2 rows. Close the remaining 38 [40: 42: 42: 44: 44] p.
Before: knit like a back up to **. Formation of the neckline. Next row: pattern 22 [24: 26: 28: 30: 33], close next. 38 [40: 42: 42: 44: 44] p., Patterned to the end of the row. Further knit the first part as back before the formation of the shoulder bevels. Close 7 [8: 9: 9: 10: 11], n. At the beginning of the next. and in every second series. Tie 1 row. Close the loop. Attach with faces. The sides of the yarn to the second part and knit as the first. Sleeves: on needles No. 4, roll up 35 [37: 37: 39: 39: 41] p. Tie 7 cm with a rubber band 1/1, finish off the faces. in a row. The following series (ex. ): 2 [3: 3: 4: 4: 5] ex. p. (knit from knitwear and wear. loop, 2 kn. item) 16 times, knit from stretch knit. loop, izn. to the end of the row = 52 [54: 54: 56: 56: 58] p.
Change the needles to No. 5 and knit with ĸosami for rykawa, adding each side by 1 p. next. next, then in every 8th [8th: 6th: 6th: 6th: 4th] for now = 60 [66: 72: 76: 70: 66] n, then every 10 m [8th: 8th: 8th: 6th: 6th] row, p = aa [70: 74: 78: 82: 84: 88] p. The added loops knit the faces. satin stitch. Knit right up to the total height of the sleeve 47 [47: 47: 48: 48: 48] cm, end it. in a row. Forming a Rykawa Backlash. Close down 5 [6: 7: 7: 8: 9] on page 13. 2 rows. Bind 0 [2: 4: 4: 6: 8] to lines. Reduce 1 p. At the end of the trail. rows, then in the second row until = 34 [38: 40: 44: 42: 48] the item will remain, then in each row until = 24 [28: 30: 34: 32: 38] § Close the loop freely. Collar: on needles No. 4.5, type 104 [108: 112: 112: 116: 120] p. Next, knit with 7 cm with a 2/2 cutter. Replace the needles on number 4, tie 13 cm with a 2/2 bezel. Row 1: Rezinka, to the last 8 paragraphs, reverse. Row 2: Remove the 1 p. Tight rubber band, until the last 8 p., Turn. Rows 3 - 4: remove 1 par. Of rubber, up to the last 12 par., Turn. Steps 5 - 6: Remove 1 p., With a rubber bar until the last 16, and turn. Rows 7 - 8: remove 1 pp. Tight, lash up to the last 20 pp., Turn. Continue in the same manner, reducing by 4 points in each 2 rows so that up to the last 36 points and turn. Next row: remove 1 p., Rubber to the end of the row. Close the looped elastic. Assembly: sew the shoulder seams. Insert the collar over the lower part (see photo). Sew up the sleeves. Stitch the battles and stitches of the walls.